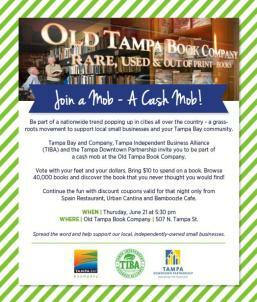 Join a Mob - A Cash Mob Tonight at Old Tampa Book Company! Hello there everyone! Jerm here to tell you about a cool event going on tonight in downtown Tampa ! Be part of a nationwide trend popping up in cities all over the country - a grassroots movement to support local small businesses and your Tampa Bay community. Tampa Bay and Company, Tampa Independent Business Alliance (TI BA) and the Tampa Downtown Partnership invite you to be part of a cash mob at the Old Tampa Book Company. Vote with your feet and your dollars. Bring $10 to spend on a book. Browse 40,000 books and discover the book that you never thought you would find! Continue the fun with discount coupons valid for that night only from Spain Restaurant, Urban Cantina and Bamboozle Cafe. That&apos;s it for now, and be sure to come out tonight and check back often for things to do in Tampa Bay!